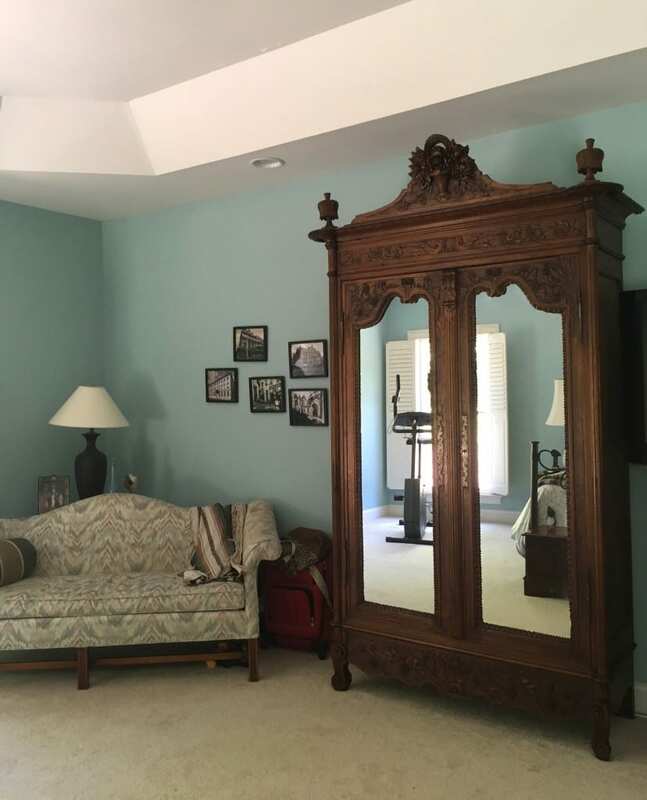 Our series of client spotlight blog posts shows how our antique furniture and lighting look in our customers’ homes. These are some of our most popular blog posts among people who read our antiques blog! Anyone who is interested in home decor enjoys a sneak peek inside someone else’s house. It’s also a good way to see how other people live with antiques and incorporate them into today’s homes. Plus, thanks to the kindness of our customers, we get a mini tour of some mighty fine homes! Here is a roundup of our antique furniture customer spotlights for the last six months, in case you missed seeing them. Click the links to read the full story and see more photos. This is an example of one of those mighty fine homes I was telling you about! 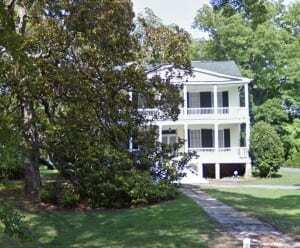 We delivered a handsome antique French Renaissance buffet to the this gorgeous historic home built in 1810 in Winnsboro, SC. 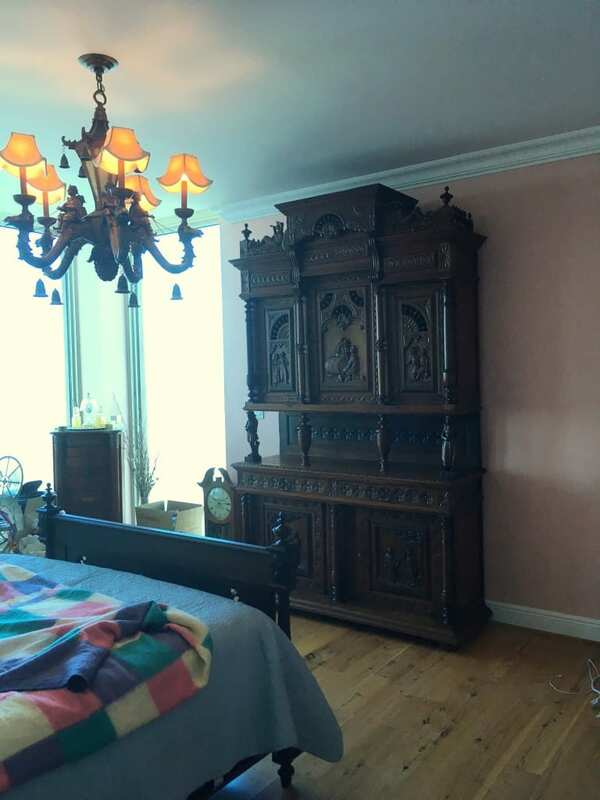 Read the antique Renaissance buffet blog post to see photographs of the interior including our intricately carved antique buffet in the charming dining room and several of our vintage chandeliers hanging in other rooms. Greg and I personally delivered a stunning French antique Brittany bed and a Brittany buffet to our customer May in Pensacola Beach, FL. May retired here but she used to travel a lot to Europe and she loves Paris, so she especially enjoys buying antique French furniture. 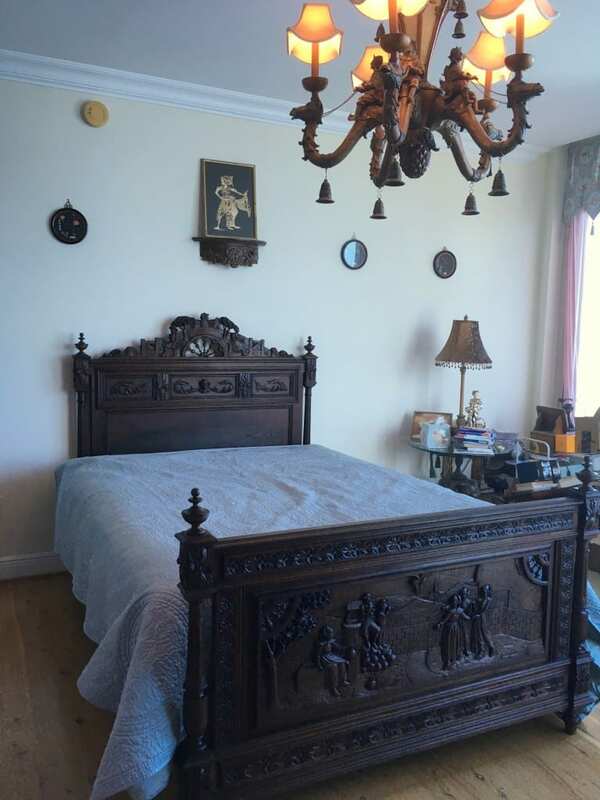 May bought an 1880 chestnut wood French Brittany antique bed, heavily carved with scenes of villagers and windmills. She also bought a Brittany style buffet dating to the same year, and asked us if we could alter the buffet to fit a TV for her bedroom. We could and we did! See more photos of the converted buffet and of May’s 14th floor apartment with its lovely views in the Antique Brittany Buffet and Bed blog post. Fran P. in Concord, NC, bought this beautiful set of vintage French Rococo dining chairs for her dining room. The six mahogany vintage French dining chairs date to 1950 and the chairs feature curvy lines from the cabriole legs to the carved curlicues. See more of the story and photos at my Vintage French Rococo Chairs blog post. We delivered a handsome antique French Provincial armoire to our customers Paul and Lane near Clemson, SC. for them to repurpose into a unique gun cabinet! 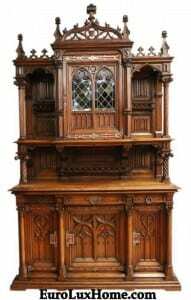 The armoire is carved in the Normandy style, dating to 1890, with a large carved vase of flowers on the top and many carvings of birds. Paul is going to convert the armoire himself. Lane is pleased to have a terrific full-length mirror in the master bedroom and she likes the fact that the mirrored doors will hide the gun collection. 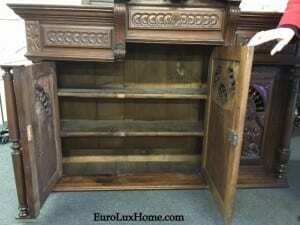 See our blog post Antique Armoire Repurposed as a Gun Cabinet for more pictures including the antique Louis XV Buffet the couple bought from us for their dining room and another example of how a bookcase was repurposed as a gun cabinet! See more client spotlights at this link, including new, vintage, and antique furniture and home decor. 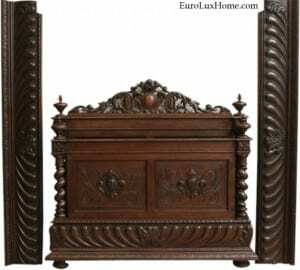 This entry was posted in Home Design Ideas and tagged antique French bed, antique French Brittany, Antique Furniture, bedroom furniture, Brittany Style Furniture, Buying French Antiques, dining room, French Antique Furniture, French Antique Furniture Blog, living with antiques, Rococo Style on June 30, 2017 by admin. Greg and I just delivered a French antique Brittany buffet and Brittany bed to our customer May in Pensacola Beach, FL. 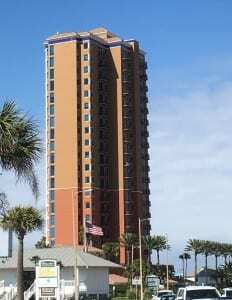 It was one of our slowest deliveries because we had to make a bunch of trips up and down the elevator as May lives on the 14th floor. 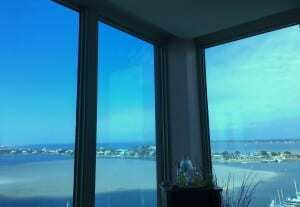 But what a spectacular view she has from every room in her lovely home, which is filled with European antiques! May retired to Pensacola Beach from Connecticut, but in her corporate life, she traveled frequently to Europe. That is how she fell in love with European interior design, and Paris is her very favorite place to be. May bought a couple of pieces of furniture from EuroLuxHome.com. The first was an 1880 French Brittany antique bed. The antique Brittany bed is heavily carved in chestnut wood, with wonderful scenes in traditional Brittany style. The top of the headboard is carved with a man and women relaxing beneath a windmill. You can almost see the sails turning on the windmill because the carving is so detailed! The footboard panel depicts merry country villagers celebrating. Floral carvings and ship wheels also adorn the bed. You can see close-ups of similar carvings in the antique French Brittany furniture currently for sale on our website. The antique French Brittany style buffet also dates to 1880 and it is also elaborately hand-carved with scenes of rural life. Figures of a man and woman act as support columns and add a whimsical touch to this beautiful antique buffet. These French country folk know how to enjoy themselves! Here they gather round a wine barrel to enjoy themselves after a long day working in the fields! May contacted me to ask if we could have the Brittany buffet altered to accommodate a TV for viewing in her bedroom. We had a local restoration company remove the central support in between the left and center upper doors, and attach it to the end of the left door. They did a wonderful job. The Brittany buffet and bed looked fantastic in May’s bedroom and they now enjoy a fantastic view of the ocean and bay. Bo, May’s charming whippet, was very helpful during the whole delivery. I wish I had taken a photo of him! He was such a pretty dog. Then we left to drive on to New Orleans… More about that in another blog post! 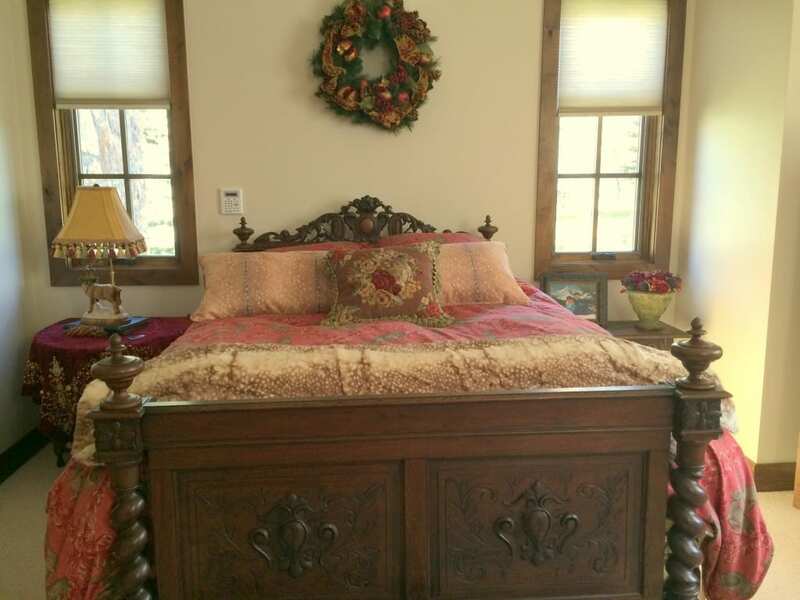 For now, thanks to May for letting us share her stunning views and photos of the antique Brittany bed and buffet in her home. 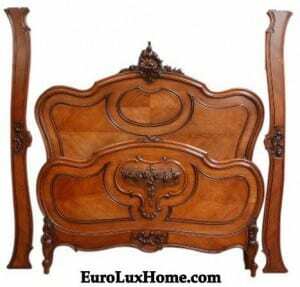 This entry was posted in Client Spotlight and tagged Antique Brittany Buffet, antique buffet, antique French bed, antique French Brittany, antique french buffet, antique French furniture, Antique Furniture, bedroom furniture, Brittany Antique Furniture, Brittany Style Furniture, French Antique Furniture, living with antiques, Master Bedroom Suite on February 18, 2017 by admin. Our latest container of beautiful antique furniture just arrived from France and we’ve combined all our holiday promotions into one and then s-t-r-e-t-c-h-e-d the promotion even further. That means our blog readers get a 15% discount on all antiques and home decor at EuroLuxHome.com until December 8, 2014. Choose from antique, vintage, and new furniture, including buffets, tables, chairs, beds, bookcases, and chandeliers and other lighting. 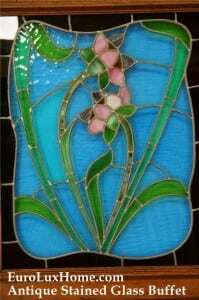 Or browse our gorgeous home accents from ceramics to tapestries and from throw pillows to pewter plates. We are especially excited about our fabulous new selection of antiques. We’re unpacking the antiques that just arrived from France even as you read this. One highlight is this magnificent antique French Gothic buffet. 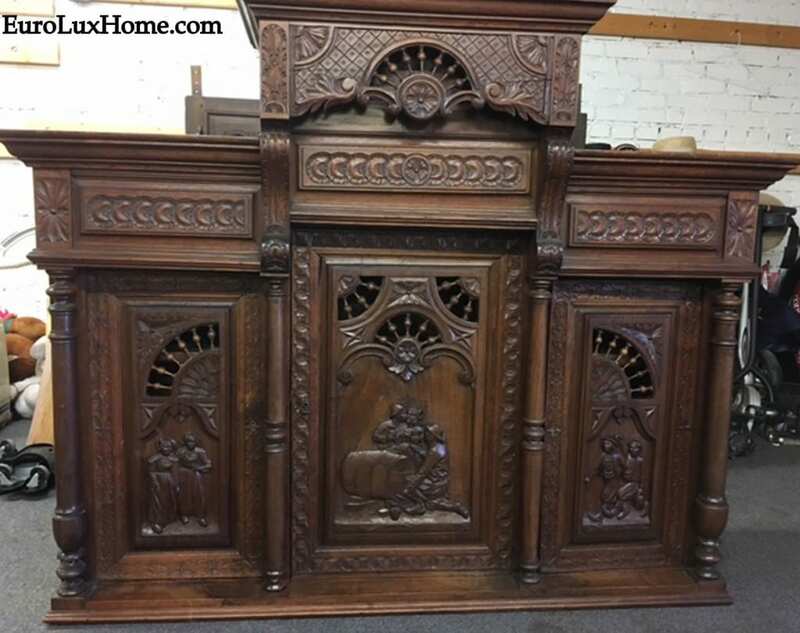 Dating to 1880 and intricately carved in walnut wood, the 9-foot-high buffet is sure to be a stunning focal point in anyone’s home. The noble pediment and arched stained glass windows are truly impressive. 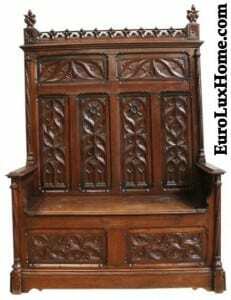 We’ve got a sturdy oak antique French Gothic bench too, also carved around 1880. 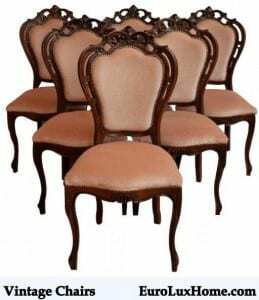 If your taste runs more to French Rococo style, I think you will love this set of six vintage French Rococo dining chairs. The 1950 vintage mahogany chairs are packed with sensuous allure for your sparkling dinner party. 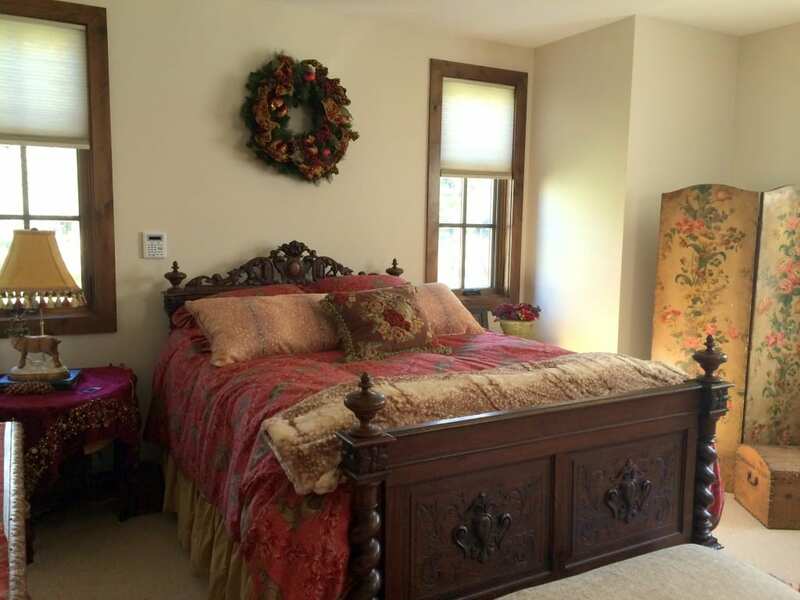 After your elegant soiree, retire to your antique French Rococo bed! I suspect that this incredibly handsome antique French dining table in the Renaissance Hunting style will not last long in our store but I want to show it to you anyway! 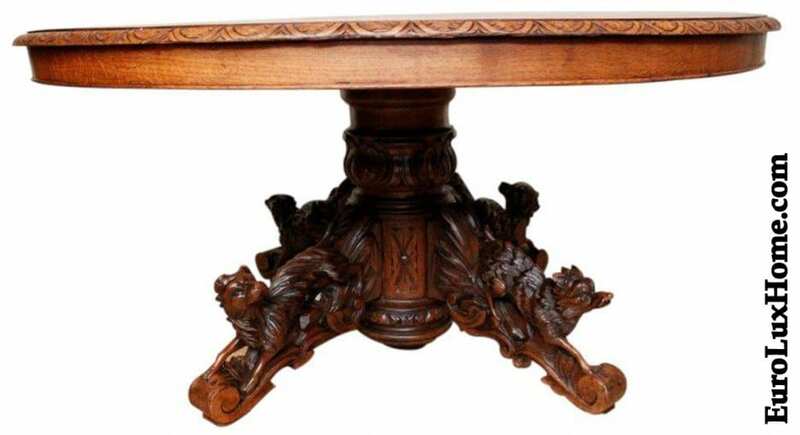 The antique French Hunting table is a wonderful addition to a Renaissance style dining room, crafted in France in around 1880 and richly carved with animals on the chunky pedestal, including a hound and a fox. The offer is valid from 28 to December 8, 2014. Happy shopping! 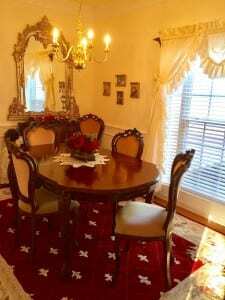 This entry was posted in Holiday Fun, News and tagged antique dining table, antique French bed, antique french buffet, antique French furniture, Antique Furniture, Antique Gothic Buffet, coupon code, discount, French Vintage Furniture, Gothic, holiday gifts, Hunting Style, Rococo Style, Thanksgiving on November 28, 2014 by admin.